1 of 2 Heat oven to broil. Combine seasoned turkey (see Note), ricotta, parsley, bread crumbs, milk and egg in a large bowl. Mix gently to combine. Shape into 15 meatballs, 3 tablespoons mixture for each. 2 of 2 Heat oil in a large, lidded nonstick skillet over medium heat. Brown meatballs, 2 minutes per side. Sauce. Reduce heat to medium and add marinara. Cover and gently simmer on medium-low for 13 minutes or until cooked through. Spoon sauce over meatballs halfway through. 1 of 3 In a small bowl, blend 2 tablespoons oil and the garlic paste. Slice rolls or bread and brush insides with garlic oil. Broil 2 minutes to toast rolls. 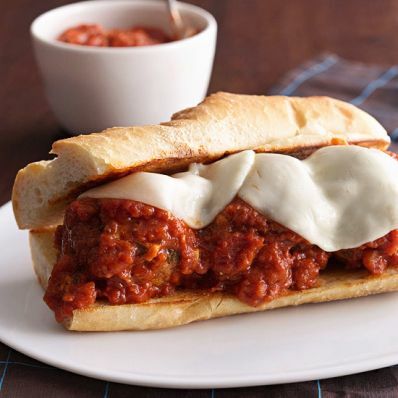 2 of 3 Once meatballs are cooked, tuck 3 meatballs with some sauce on a roll. Top with a slice of cheese and return to oven to melt cheese. Repeat with all meatballs, rolls and cheese. 3 of 3 If using plain ground turkey, season with 1/2 teaspoon salt, 1 teaspoon Italian seasoning and 1/8 teaspoon black pepper.